Level regulator for liquids, 230V The controller serves for indication and control of the level of liquids. The device is built on a modern microcontroller and has a self-learning mode. 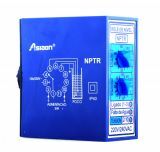 Liquid Level Controller NTPR, 24VDC, NC+NO Liquid Level Controller NTPR, with power supply 24 VAC and NO+NC contacts. List Price 44.90лв. VAT Incl. 40.40лв. VAT Incl. 38.00лв. VAT Incl. Fluid Level Sensor SL-M5, magnetic, 100VDC, NO Fluid Level Sensor model SL-M5 with magnetic switching element, switching voltage 100 VDC and 1 NO contact. List Price 33.90лв. VAT Incl. 32.20лв. VAT Incl. Liquid Level Controller STS-303-04, 220 VAC, 50 Hz Liquid Level Controller STS-303-04,with supply voltage 220 VAC and operating frequency 50 Hz. Liquid Level Controller Probe, STS-303-04, L100 mm Probe for Liquid Level Controller STS-303-04 with probe length 100 mm. Electric float QW-M15-3 for monitoring fluid level, 250VAC, 16A, NO + NC Electrical level switch QW-M15-3 for monitoring liquid level with a minimum level of 0.2m. 1NO + 1NC contacts. Counterweight is added to the kit. Probe Level Signal HJ36, NO + NC, 250VAC, 15A Probe Level Signal HJ36 with NC + NO contacts, rated voltage 250 VAC and rated current 15 A. Probe Level Signal, L135, 220 VAC, 1 A Probe Level Signal, ESPA 01, with probe length 135 mm, reed switch and rated voltage 220 VAC. List Price 16.00лв. VAT Incl. 15.20лв. VAT Incl. Probe Level Signal, L100 mm Probe Level Signal,with probe length 100 mm and Г-shaped cable coupling . The probe must be connected through load to the output! Probe Level Signal, HJ37, NC Probe Level Signal, HJ37, with NC contact ,rated contact 250 VAC and rated current 6 A. Probe Level Signal, ESPA 01, L100 mm, NC, 220 VAC, 1 A Liquid Level Probe, ESPA 01,with probe length 100 mm,reed ampoule and rated voltage 220 VAC. Fluid level regulator, 230V BOX, control of aggressive liquids The liquid level controller serves to indicate and control the level of liquids (water type, and in the self-learning mode can also be programmed for liquids with low conductivity) in tanks and other vessels by means of two probes. Liquid level controllers are devices designed to maintain and monitor a set level in a vessel with water and aqueous solutions. They adjust the minimum (lower) and maximum (upper) level in boreholes, wells, tanks, etc.The setting of the desired level is carried out by moving both probes (sensors) connected to the level controllers. Level controllers are widely used in industrial facilities and equipment, water treatment plants, home and residence areas and more. Vikiwat Ltd. is a direct importer of all types liquid level controllers and sensors with competitive prices. If you need to save money and time, visit our online store for best offers! Vikiwat - all about electronics!